See what’s inside the new edition of ImagineFX – on sale now. 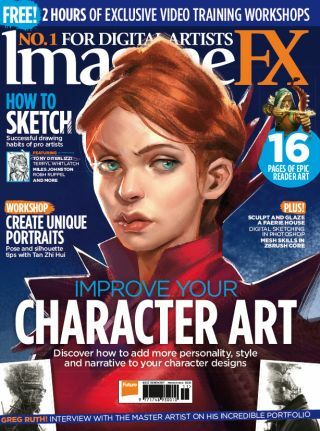 Get an insight into how to create distinctive characters brimming with personality in the latest issue of ImagineFX – on sale now! Inside issue 153 you will find out how the magazine's stunning cover art was created, thanks to a tutorial from Ramón Nuñez. Thanks to his insightful character art tips, you're sure to pick up a new skill that will help with your own character creation. Elsewhere, issue 153 of ImagineFX also contains a glimpse into the sketchbook of Chantal Horeis, a look at how illustrator Atey Ghailan creates a sketch workflow, and a core skills tutorial to help you paint with gouache. And that's not all. Take a look below at the main features heading up the latest issue of ImagineFX. You won't want to miss it. Idle sketching isn't a waste of time. In fact, the pros do it all the time to loosen up and generate ideas. To discover more about the joy of sketching, we talk to pro artists including James Gurney and Terryl Whitlatch about why they scribble away every single day before turning their attention to the job in hand. A recognisable silhouette is one of the cornerstones of a strong character design. Tan Zhi Hui shows you how to create an outstanding character outline in this Photoshop tutorial. Gorge yourself on page after page of sublime artwork from Greg Ruth, the American illustrator to the stars. Take a trip to the land of the faeries with this clay video workshop by Vicky Stonebridge. Here she demonstrates her skills with a potter's wheel and shares tips for firing and glazing a miniature metropolis. Order your copy of ImagineFX issue 153 today. Have you ever wanted to see your artwork in print? Or maybe you want to share your digital art masterpieces with likeminded readers? Well, you're in luck! ImagineFX is always open to readers' submissions. Just send your art, a headshot, and a short biography to fxpose@imaginefx.com.